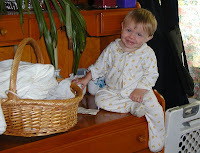 This is where I found my son a few mornings ago when I walked into the kitchen. You can see from his expression that he wasn't quite sure if I was going to be upset with him or not. "Uh... Hi- Mom,..."
But he figured it was all right when he saw I was going to be taking pictures. And just to be safe, he made sure to give me the most charming smile. Not wanting to be left out, Dolly quickly climbed up to join her brother. By then PC was SURE he was going to get away without even the slightest warning as you can see from his triumphant grin. 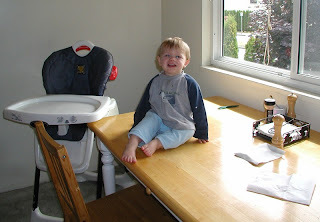 Just long enough to get my kids dressed and fed, I walked into the dining room to find PC on the table. 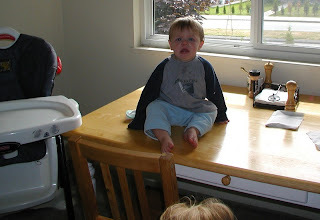 He is NOT supposed to get on the table, and you can tell that he's pretty certain he's in trouble. "Ooops." And then he saw the camera. So he attempted another charming smile, but it turned out looking more like a cheesy grin as he tried to cover up his relief. 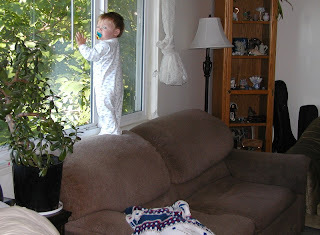 Less than an hour after the Table Episode, I went in search of my son. It was after all, nearly time for his morning nap. I found him in the bathroom trying to reach the sink from the toilet. He is NOT supposed to climb on the toilet either which is why he appears to be frozen in thought. Since he didn't get in trouble the last two times I found him somewhere, he decided to just go ahead and finish what he was up to when I walked in. 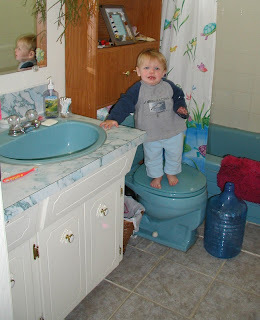 But instead, he slipped and fell off the toilet seat bonking his head on the toilet as he went down. 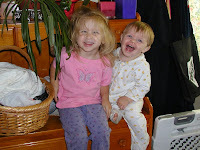 Therefore you do not get to see any charming smiles or cheesy grins. He got patched up and put to bed without further pictures. After PC woke up from his morning nap, we ate lunch like usual. 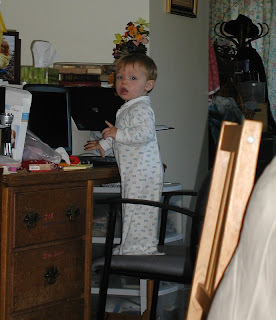 Evidently he wore his lunch that particular day, and I hadn't gotten around to replacing the shirt that had been discarded before I walked into the playroom to find PC here. At first he was a little surprised that I caught him perched on the playpen, but it didn't take him long to recover and grin absolutely glowing with pride at his achievement. 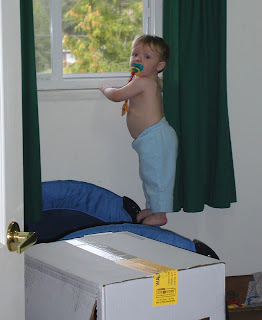 Because being perched precariously on the playpen next to an open window on the second floor and above a rough wooden toybox isn't exactly the safest place to find your 14 month old, I put the camera down and removed my son. 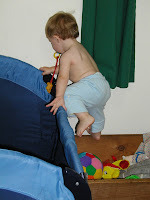 He was not impressed and immediately started his playpen ascent again. 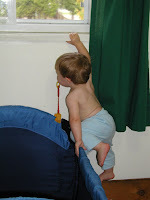 I watched while he climbed to just about where he was when I found him before he lost his balance and fell inside the playpen. He was furious to say the least. 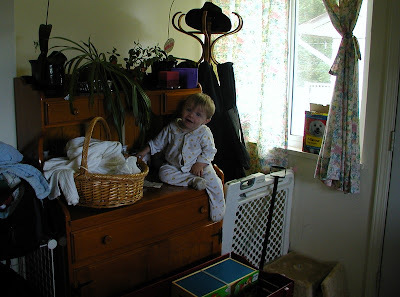 I could only laugh, because recently I had been finding him screaming in the playpen and couldn't figure out how he had managed to get into it if he was so helpless when it came to getting out. At least now I knew how it was happening. 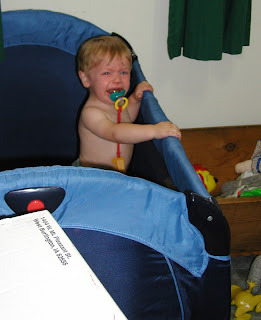 Having mercy on my screaming son, I removed him from the playpen and put him back on the floor. 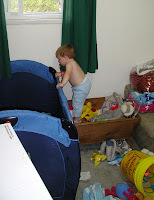 Evidently not one to learn too quickly, he started back up the toybox toward the playpen. This time I grabbed the camera again and took pictures of the process. 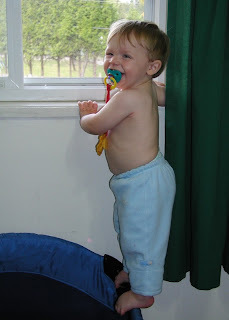 I even got a shot of him back in the playpen after he lost his balance and fell in again when he tried to turn around to grin at me in triumph. He was not pleased at having me document his embarrassment. 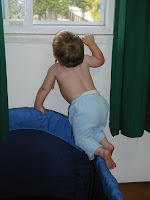 The rest of the day proved uneventful in the climbing department, but less than 24 hours after the Kitchen Climbing Incident my little Monkey Man was at it again. 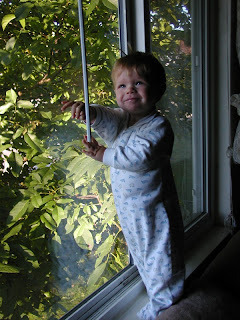 He'd been awake all of five minutes and from the angelic little face below he was just content to be climbing again. I love this expression. Of course no sooner did I turn around to find PC at my desk tampering with my computer. This is another thing he is NOT supposed to do. 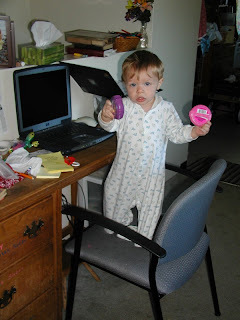 Thus his startled expression at being found out and his tentative subject change in hopes that I might overlook the offense and possibly grant his request for some gum! Mommy calls the nearest kid, changes or puts a diaper on said child, wrangles child into his/her pajamas, and then releases child to "Go say 'Good night' to Daddy." Then Mommy repeats the process until all children are dressed for bed. 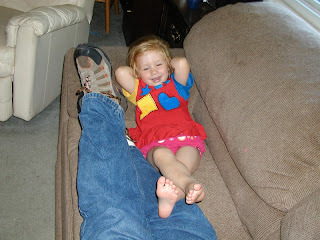 Now, 'saying Goodnight to Daddy' is a very popular thing. 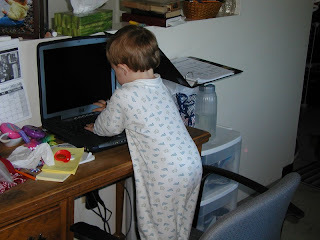 There are privileges to being the first one to get to him, so strangely enough, our children clamor to get ready for bed unless they think they can try saying 'good night' before getting dressed for the occasion (which usually results in that child losing the race to Daddy). You see, Daddy is so much fun to say goodnight to. He might tickle you, or toss you in the air, or roar like a lion with you or any number of similarly fun things. The only problem is, only ONE kid can say goodnight at a time. 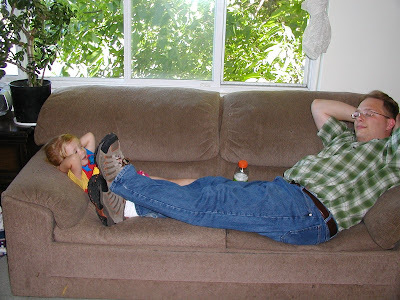 So, if you weren't first, you have to wait your turn, and if you were first, well, you have to go get into your bed while Daddy repeats the fun with your sibling. After each child has said goodnight to Daddy, Mommy provides a soother (aka: pacifier), blanket, sippy cup of water and then rattles off a list of forbidden things to do before turning out the light and closing the door. One memorable time we went through our bedtime routine and Dolly happened to be the first one ready to say 'goodnight to Daddy'. When it was PC's turn Dolly was sent off to bed. 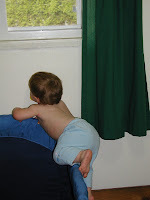 Since she had to wait in bed until PC joined her, she started fussing. Sir finished saying good night to PC and gave him to me to put to bed before grabbing the Magic Daddy Communicator and asking Dolly what the problem was. She stated her case, Sir replied and the subject appeared to be ended. Until Dolly started calling out, "Da-aaddy,....". Sir answered with, "Yeees?" "I need a soother" Dolly insisted, "You have to wait for Mommy to get you one." Sir answered. "Hey! Da-aaddy....". This time Sir made the bright move of answering, "Yo Dolly...," in the same sing-songy voice his daughter had used. Dolly immediately picked up on the new little word and was so excited about using it that she abandoned her bed altogether to come to our bedroom door to say, "Yo Daddy....." with a very mischievous grin on her face. Both Sir and I couldn't help laughing at what we were going to be hearing for who knows how long and Dolly, very pleased with herself and aware that she had picked up on something we would have been happier to have had picked up some years in the future, could only grin some more and repeat her new discovery. Finally she was re-sent off to bed, the bedtime routine was completed and without further ado, the kids were good and went right to sleep. It's just too bad that type won't properly express the nuances in the way Dolly kept saying, "Yo Daddy" because reading it isn't nearly as much fun as being there to hear it in the clear little voice of a two year old! Back on the 14th of this month I started working on a post. Then it started to get really really long, so I decided that since half of it was leading up to what I wanted to say, I could actually post TWO posts... imagine that. But then I needed the perfect picture for the prequel post and it involved entering the nursery and every time I'd remember about taking the picture... well, the nursery would be occupied and I didn't feel like sneaking in just then. So I procrastinated. And then, there wasn't even time to procrastinate because we were getting ready to host our annual Summer-End Barbecue. But now, the barbecue is over, I finally got the picture I needed and you can read the prequel to the post I started nearly two weeks ago. "Before I go on, I need to explain the 'Magic Daddy Communicators'. Magic Daddy Communicators are the special name we use when referring to our fancy schmancy baby monitors. 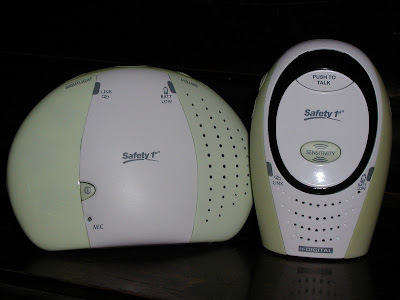 We have a regular plug-into-the wall baby monitor set that works just fine and comes with plenty of static if you don't tip the antennae just the right way, but we have boxed them up and replaced them with an expensive DIGITAL version that provides crystal clear transmissions. Among many features, the new set came with a fancy option of 'two-way communication' which means that by pushing a button on a parent unit we can talk to the kids in the nursery. Of course we call this monitor set the 'Magic Daddy Communicator' because when we first got it, if the children started playing or talking too much instead of going to sleep, Sir would push the button and ask if everyone was being good. For the first couple of weeks, our kids were certain there was some kind of terrifying thing in the corner of their room. It could tell what they were doing, and it would TALK to them! This caused a lot of terror, and wailing, and in general, didn't calm them down a bit, but instead only made them even more awake. After a while, the kids got used to hearing the Voice from the Corner and then recognized Sir. It was Sir who did this since he found so much amusement in the reactions he would get from talking to them. One day while Sir was at work, I found Dolly carrying one of the parent units around the house all the while talking into it, "Hi Daddy, Are you there Daddy?, Can you hear me Daddy?" She thought it was some special way to talk to Daddy when he wasn't around. After all, he was talking to her when it was bedtime and he wasn't around then. Anyway, the terror seemed to wear off, and the kids adjusted to hearing us speak to them, and would even respond cheerfully. So eventually, the special feature of two-way communication actually turned out to work the way it was intended. Back to my bedtime story...."
But now, you can wait for me to post the sequel sometime in the next day or two. I think it's been long enough since I posted last and I'll be having this baby pretty soon which will probably put another gap in my posting patterns. And I really do want to get the handful of posts that have been wracking up in my brain over the last two weeks posted BEFORE I go into labour! This morning, PC got up early and ate breakfast before Dolly was even awake. When she did get up, I asked Dolly what she wanted, fixed the desired Cinnamon Toast and then retreated to my room to say good morning to Sir. PC, followed me with a book and since Sir was still waking up, I obliged my son and started reading the book to him. 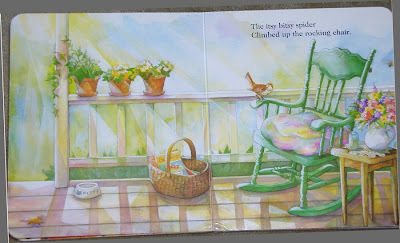 "The itsy bitsy spider... climbed up the waterspout..."
Meanwhile, out in the dining room, Dolly finished her toast and after not getting as satisfying a response to her calls as she expected from me, she hopped out of her booster and joined the rest of us in my room. I paused from reading the book to ask Dolly if she was done with her breakfast, if she wanted more, or if she wanted something else. She replied, "I want some strawberries!" "Ok," I answered half absentmindedly, "Get into your chair and I'll get you some spiders." Dolly had already stared to run back to her chair, and as Sir rolled over to laugh at me and I realized what I had just said, I started to laugh at myself glad that Dolly had apparently overlooked my slip of the tongue. But no, I'd hardly caught my breath when my frantic and very distressed daughter came fleeing back to my room nearly in tears to declare, "I don't want sphiders!" I laughed even harder, and poor Dolly was getting very distraught and confused. When I finally calmed down enough to talk normally, I assured her that I would get her some strawberries NOT spiders as soon as she got back into her chair. She ran off, and I followed leaving PC to wonder why he only got half a book read to him. He soon realized what was going on out in the dining room and joined us there for his share. As Dolly looked her first strawberry over very carefully, she said to me, "There's no sphiders, Mommy." She appeared very relieved, and I agreed with her that there were indeed, no spiders with her strawberries. How many of you have filled your dishwasher, put the soap in, attached it to the kitchen faucet (we have a portable dishwasher), turned the dishwasher on and left the room? Well, that's what I did this morning and I was very happy to have made it all the way to the dishes by 10am. Some days one thing after another happens and by the time I make it through my routine to the kitchen it's a lot closer to lunch time than breakfast time. Anyway, when the dishwasher was done I returned to the kitchen to turn the water off. There's no need to be taking up the sink faucet if the dishwasher is just going to dry for a while. Only, the faucet was already off. I had run the dishwasher without water. You can imagine my great feelings of intelligence. Had I ruined our dishwasher? It was a birthday present to me this year so I wouldn't have to hand wash all of our dishes with three kids running around under foot. I really didn't want to go back to hand washing dishes. I left some messages on msn for Sir telling him what I had done, and decided to re-run the dishwasher -with water this time. None of the soap had been spewed out into the sink, so I figured it was lost somewhere inside the dishwasher and the best way to sort it all out was to let the dishwasher rinse itself in a second wash.
Of course, the dishwasher started on it's water-enhanced wash without any complaints and I waited with my fingers crossed to see what would happen. It's done now, and the dishes inside are clean. It ran as if nothing abnormal had happened. Hopefully I didn't ruin anything this morning, but I guess only time will tell. So, this boring post was just to express my great relief at probably not having to hand wash my dishes while I can barely reach the sink over my stomach. And I didn't see the need to bore you with a dull picture of my dishwasher.